For a long time, gongs have become the cultural symbol of people in the Central Highlands of Vietnam. At the contemporary time, it is gaining its ever-increasing popularity to embody the unique cultural values that cannot be mixed with others. 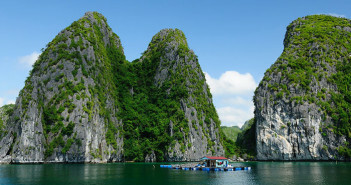 If you are interested in exploring the distinctive beauty of Tay Nguyen as well as its own traditional and artistic music culture, a visit to this lovely land will definitely meet your expectation. 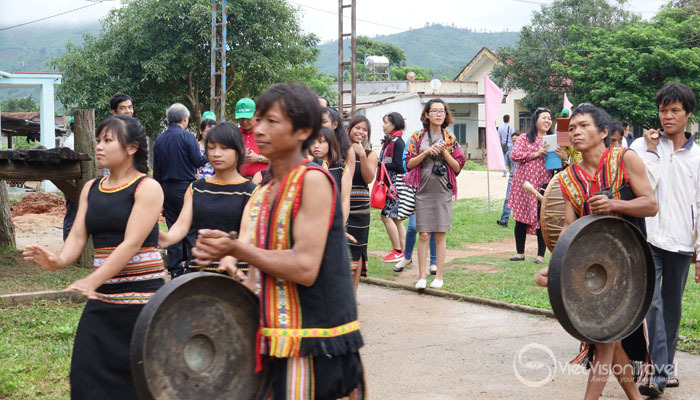 I had a chance to take part in a variety of wonderful festival in the Central Highlands and I felt that I could not find anywhere that is full of rich culture which is deeply imbued with regional identities. Therefore, this is to say how beautiful people of the Central Highlands are. From my own experiences, I gonna share with you what I experience with Cultural Space of Tay Nguyen Gong. 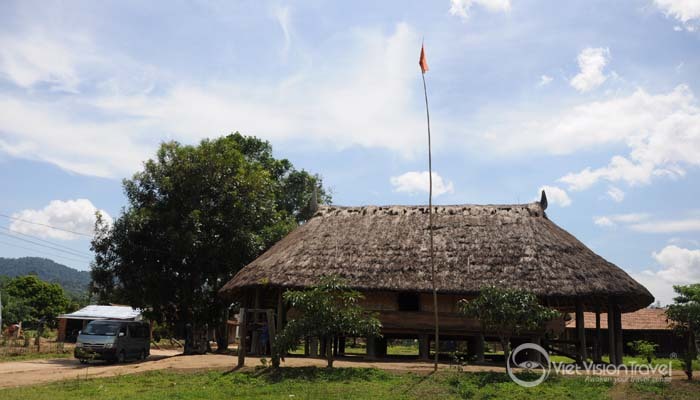 Tay Nguyen, a historical place with the diverse ancient civilizations dating back hundreds of years ago, is famous for countless prehistoric traditional culture values. Particularly, the world’s most remarkable cultural characteristics here known as Culture Space of Tay Nguyen Gong is officially recognized by UNESCO as a Masterpiece of Oral and Intangible Heritage of Humanity in 2005. 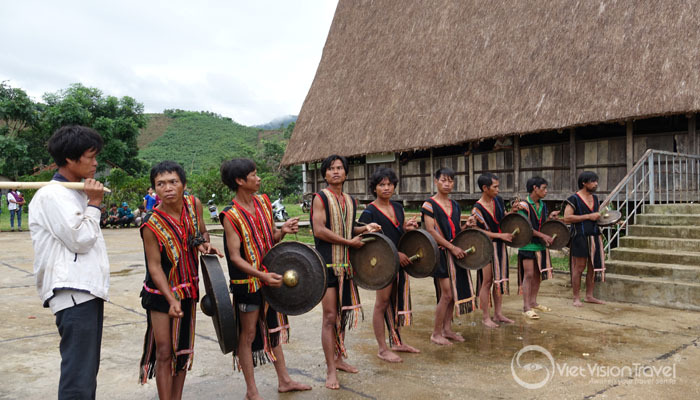 The gong culture dominantly exists in five major provinces of the Central Highlands encompassing Kon Tum, Gia Lai, Dak Lak, Dak Nong and Lam Dong. And this kind of unique art-form belongs to a group of ethnic people namely the Ba Na, Xo Dang, Co Ho, Ro Mam, E De and Gia Rai and so on. In the prehistoric time, this special musical instrument was commonly made from rock or stone and they were used by local men and women for special occasions of the year. Turning into the modern time, prehistoric gongs had received a considerable innovation to create a distinct sound compared with other musical forms. The major materials come from a mixture of brass alloy or a combination of bronze, silver. The size of gongs can be variable, but normally ranges from 20cm to 60cm in diameter. Characterized as a popular musical instrument form of Tay Nguyen, the sound from gongs is considered to be a language communicated to the supernatural world. 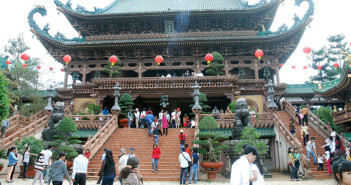 Therefore, it has a lot of cultural values and traditional customs. What and when is gongs used for? You can find a lot of interesting musical instruments and an abundance of great culture identities in every corner of the world. Each has its own sound, value and is used in different events for different purposes. Cultural Space of Tay Nguyen Gong, with no exception, often take places in several popular and important events such as welcoming new rice crops, buffalo feasts, New Year, Gong Festival and Tay Nguyen Spring Festival. When I visit Tay Nguyen, I saw that gongs are used by local men wearing colorful clothes. People often professionally dance around a big fire or sit in circle around a big jars to drink wine together. The sound created from playing gongs is believed to bring about wealth, peace and prosper for people in the Central Highlands. Cultural space of Tay Nguyen Gong, in the belief of local people, is a symbol for power, wealth and also prestige. For the same reason, this cultural asset helps to connect individuals to the whole community, thereby creating a strong regional unity. From then, they will naturally live life to the full or make great efforts to work in an effective and progressing way. Or in other words, people in the same community enthusiastically help each other whenever facing any difficulties in work-daily life. Each culture, carrying its own unique value, attaches great importance to shaping the identities as well as in local people’s way of living. With people of the Central Highlands, this masterpiece is the representation of soul beauty of locals who are always amiable, friendly and highly cultured people. In the beliefs of Tay Nguyen people, gongs have the implied power of protecting their own lives as well as property because of helping locals fight against evil. More importantly, the beauty of distinct melody created by the perfect combination of gongs and cymbals describes the sublime and long-lasting beauty of people and culture. Gongs in general and culture space of gong in particular today are irreplaceable culture value to be the symbolic voice of people and gods that will be preserved and handed down to later generations. Until now, although a myriad attractive and impressive modern kinds of music and musical instruments, the unique value of Culture Space of Tay Nguyen Gong should be taken into serious consideration to not only preserve but also promote its richness and diversity. Experience a lot of cultures in different countries in the world, I still find Cultural Space of Tay Nguyen Gong is the most wonderful ones that made a deep impression on my heart and mind. For sure, if I have one more chance, I will definitely come back someday. Hope that you are also interested in it and pay a visit to enjoy it in near future.